Expert author Ron Rhodes helps to dispel believers' feelings of insecurity when confronted with cults. 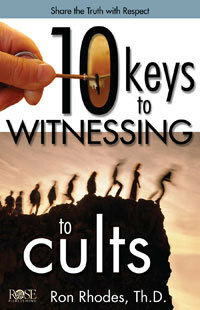 10 Keys To Witnessing To Cults will prepare you to witness in a loving, respectful and informed way to the cults at your door, your work, or your neighborhood. Tips include spotting common objections cultists are trained to answer, strategic questions to ask, and easy ways to demonstrate Jesus' deity, plus much more.